LOCAL historian Jim Hamilton, well known for his chronicles of the Coalburn area, his work with Lesmahagow Parish Historical Association and his recent book on Lanarkshire coalminers, died on Friday, 9th April 2004 after a brief illness. He was 82. 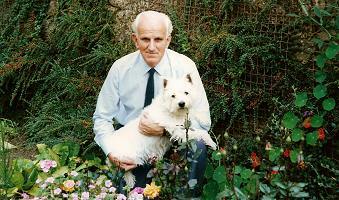 Jim gained national respect for his work, receiving a parchment award from the British Association for Local History in 2002, but more importantly he collected memories and photographs to preserve the very human history of his area for the pleasure of the local community and future generations. Families sought out his work and carefully preserved it as the record of their own background. Jim Hamilton was born in 1922 and made his career in social work with the local authority, being responsible for social work in Motherwell when he retired from Strathclyde Regional Council. But all his life he had been interested in local history, and retirement gave him the time to pursue that with even more dedication. Jim's father and both grandfathers had been coalminers and Jims interest in family genealogy and the history of his own village, Coalburn, led firstly to a series of 200 articles in a local newspaper. He then started producing publications preserving the memories of local families and the history of organisations, backing interviews with thorough research at New Register House in Edinburgh. This led to publications including 80 booklets on the Coalburn Chronicles, and booklets covering Lesmahagow, Blackwood, Douglas, Rigside, Glespin and Braidwood. Jim was also deeply into photographs, building up a large collection of old photographs, which he was happy to make available to a much wider audience, among other ways supplying them to newspapers. Other photographs old and new were assembled into videos in a "Then and Now" series covering various villages in Clydesdale and the surrounding area, which proved overwhelmingly popular with those returning to trace their family roots. He took his own photographs too, and built up a record first on cine film and then on video of local events such as school festivals and concerts, creating archives for the future. In the month before his death, Jim attended the opening of the One Stop Shop in Coalburn. A heritage room was to be created there, and Jim was looking forward to having much of his material placed there where the local community could have access to it. Jim was busy up until his death. In his final year, he produced an acclaimed volume of photographs and reminiscences of those involving in the mining life in Coalburn and the surrounding villages. It was called "Lanarkshire Coalminers and their Wives" as Jim had a lot of respect for the women who struggled to keep their families going on the pittance paid as wages in those days. And with Archie Cameron of Coalburn he had embarked on his latest project interviewing on film local men who had been in the Vietnam and Korean wars, to preserve their memories for posterity. Jim had many other interests, and for 10 years chaired the Lanarkshire Cancer Care Trust, but it will be for his compilations of local history that he will be remembered for generations to come. "This was always part of his life," said his cousin Helen Walker. "He just dedicated himself to it, and it has given so much pleasure to individual families who have received records of their families." Jim, who lived in Hamilton, was survived by his wife Maureen, sons, Millar and Graham, and daughter Linda, as well as 3 grandchildren. Based on the obituary published in the Lanark Gazette on Thursday, 15th April, 2004. Photo from the Jim Hamilton Archive. 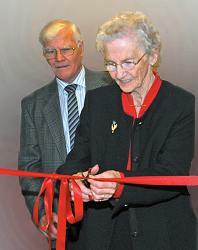 Jim's wife, Maureen Hamilton, who formally opened the Heritage Centre on Saturday 24th November 2007, passed away on the 24th November 2017.